The first car-share lane to be built on a UK motorway has been given the go-ahead by the government. The one-mile (1.6km) lane will open in 2007 at the junction of the M606 and M62 in West Yorkshire, Transport Secretary Alistair Darling announced. It will allow cars carrying more than one person priority entry from the M606 southbound onto the eastbound M62. A second such lane will open in 2008 on the M1 between junction 7, near Hemel Hempstead, and junction 10, in Luton. That forms part of a planned widening scheme with work, which begun on Monday, expected to take about 32 months to complete. Work on the lane in West Yorkshire is due to begin early next year. The £2.5m lane, on the busy route between Bradford and Leeds, will cut rush-hour journeys by eight minutes on average. Single-occupant vehicles would not suffer from additional delays and should also benefit from improved journey times, the Highways Agency said. Mr Darling told BBC Radio 4's Today programme that car-share lanes had been used successfully in the US, Australia and Canada. "I think it's one of a range of measures that we need to introduce because, frankly, in 20 or 30 years time we'll face absolute gridlock unless we're prepared to take sometimes difficult, sometimes unpopular decisions. "But, to my mind, it's a sensible measure to try and encourage people where they can to share lifts, especially if they're going to work maybe in the same place or same area." The government would also be looking into road pricing as another possible means of tackling congestion, he added. Lane rules will be enforced by either cameras or extra police patrols, a Highways Agency spokesman said. Lone drivers found in the car share lane could face fines or penalty points. "This section of the road suffers significant congestion as it is a busy commuter route between Bradford and Leeds," said an agency spokesman. 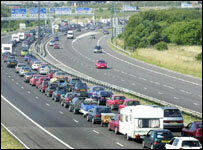 Studies have shown that at peak times 84% of vehicles using the motorway at this point have only one occupant.